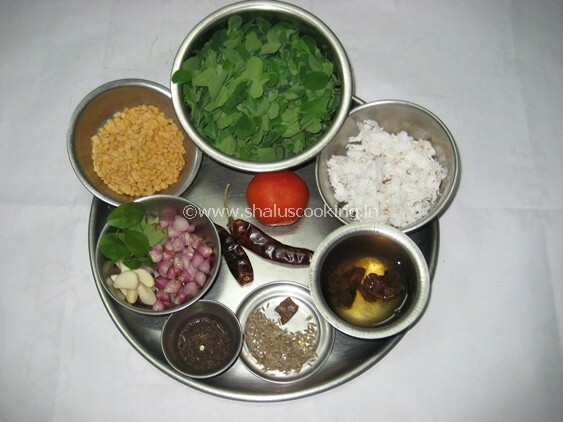 Murungai Keerai Kuzhambu - Drumstick Leaves Curry, this is one of the famous dish in Tamil Nadu. This is one of the healthier dish too. I have read that Murugai Keerai is rich in iron and Vitamin A. Even in our home they say, when hemoglobin is low, they ask us to include more murungai keerai in diet. This will make a wonderful combination with ragi kali and goes well with steamed rice too. Murungai keerai is little hard to digest, so avoid eating it for dinner and be little cautious when given to kids. 1. Keep all the ingredients ready to make Murungai Keerai Kuzhambu. a. De-stem the drumstick leaves. b. Roughly chop the shallots, tomato and garlic cloves. c. Soak the tamarind in water for 15 minutes and extract its pulp. 2. Grind the ingredients mentioned under "To Grind" section one by as shown in the picture below. 3. Heat oil in a pan, add mustard seeds, when the mustard seeds splutter, add the curry leaves, roughly chopped shallots and garlic cloves. Once the shallots turn transparent, add the tomato and salt. 4. Saute till the tomatoes become soft. Now add the tamarind extract and turmeric powder and bring to boil. Add the ground paste and mix well. 5. Let this gravy cook till the raw smell of the curry goes off. Now add the drumstick leaves and allow it to cook for about 10 minutes and switch off the flame. Tasty Murungai Keerai Kuzhambu is ready to serve. 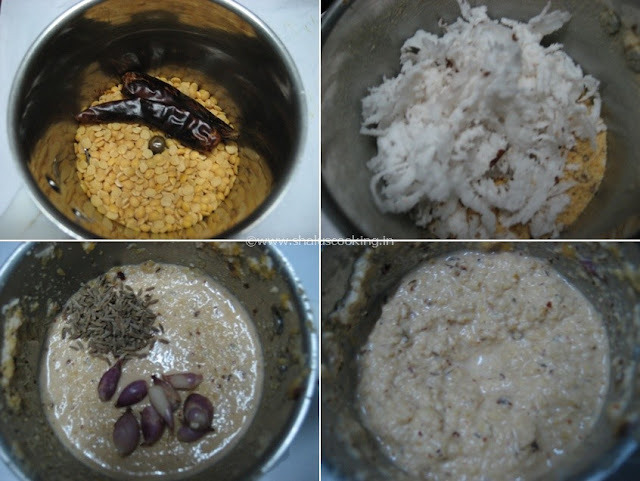 Serve it hot with Ragi Kali or steamed rice.